Outside of town, the areas to explore are designed just like Monster Hunter, but worse. The areas are divided into different sections that you can run between as you collect items and kill monsters. Except, rather than just fighting monsters in the area that you are actually in, approaching a monster prompts both of you to be warped to a large circular arena. It seems like a meaningless step that only adds to the tedious activity of repetitive battles and makes us wonder why they didn't just open up the main area a bit more for the battle to take place there. However, judging by the silly amount of pop-in we experienced in the village, the developers might have just not wanted to take the time required to design the game that way. Some parts of the not-so-fantastical landscape try to look exotic with some natural features, like an elaborate lava flow, or desert oasis, but the poor rendering of it just made us want to avert our eyes and carry on with our quest rather than soak it in. Lord of Arcana could appeal to a certain kind of gamer, despite its ample flaws, with its moderately sized compendium of equipment crafting. After several quest runs of gathering dozens of items, some possibilities for crafting begin to show, at which time the compulsive type of gamer could enjoy spending time in the hunt for additional items and special materials for crafting the next best piece of equipment, and so on. 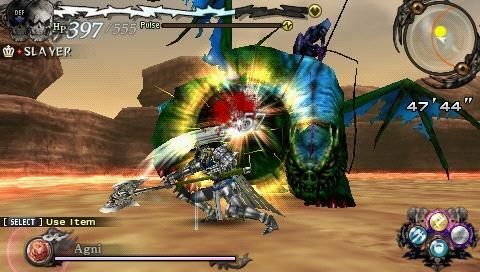 Arcana also has cooperative play for up to four people, a feature which seemed to be expected to pull the majority of the game's weight considering the popularity of cooperative modes in other games like Monster Hunter Portable in Japan. Unfortunately, the co-op gameplay has some serious issues to compound upon the game’s already buckling faults. First is the big issue that ensures Arcana can’t compete with Monster Hunter: no online play. Good luck finding four friends who all have PSPs and copies of this game – otherwise, it’s going to be a solo adventure. Even if you do manage an ad-hoc game, Arcana almost seems averse to co-op play with its clunky mechanics: if a player gets into a fight in a different part of the map than the rest of the group, then the rest of your party can not join in, leaving that single person to either fend for themselves, attempt to runaway, or die, as your party is forced to stand around and twiddle their thumbs. If any one of the players in your group does die, then the entire quest ends and everyone receives a game over screen. Nobody wants to end their 45 minute co-op quest with a game over because one person bumped into the wrong monster. A darker and much more flawed facsimile of the Monster Hunter franchise; only those with the strongest desire to play a Monster Hunter-esque experience that isn't Monster Hunter can stomach this colorless and boring game.